There’s a lot more potential Birds of Prey stars than we previously thought. Get a new look at Agents Hemsworth and Thompson in behind-the-scenes pics from the new Men in Black. Brie Larson talks Captain Marvel. Alan Tudyk is joining another comic book adaptation. John Carpenter teases that a Prince of Darkness show is on the way. Plus, HBO’s Watchmen finds some intriguing musicians for its score. Spoilers away! According to THR, Gugu Mbatha-Raw, Jurnee Smolett-Bell and Janelle Monae are the current top choices to play Black Canary, while Margaret Qualley, Mary Elizabeth Winstead and Cristin Milioti have either “tested or read” for the role of Huntress. The outlet also confirms Justina Machado (Netflix’s One Day at a Time) and Roberta Colindrez (Vida) have screen tested for the role of Renee Montoya. 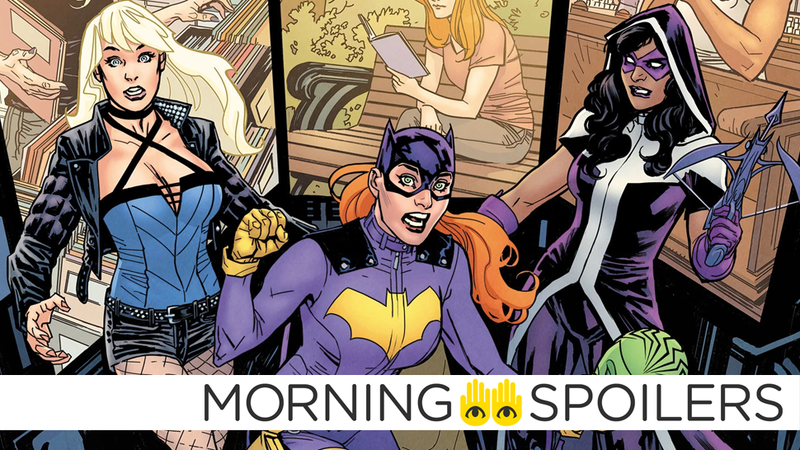 Meanwhile, Production Weekly reports Birds of Prey begins filming January 14 in Los Angeles under the working title Fox Force Five. Despite not having a director, Geeks World Wide reports Fox hopes to begin production on Gambit by February 15 in New Orleans, Louisiana. Bloody-Disgusting has an unsurprising official plot synopsis for the Child’s Play reboot. Child’s Play follows a mother (Aubrey Plaza) who gives her son (Gabriel Bateman) a toy doll for his birthday, unaware of its more sinister nature. A set photo give us an incredible swanky look at Tessa Thompson and Chris Hemsworth as M.I.B. agents. Hemsworth also shared a short set video as an Instagram story, captured below. Entertainment Tonight interviews Brie Larson in full costume. An especially chatty Venom eats a few people alive in the latest TV spot. A bizarrely somber trailer for the Goosebumps sequel details the film’s entire killer gummy bear sequence in short form. We’re talking to them about doing a theme, and maybe doing a show for them. What would you think about Prince of Darkness as a TV show? Well, maybe. Maybe not. I don’t know. I’m not going to tell you. Deadline reports BCDF Pictures has secured the television rights to Raymond E. Feist’s Riftwar novels, concerning a magician escaping through time after aliens invade his island kingdom. Atomic Blonde screenwriter Kurt Johnstad is currently attached to adapt the first book in the series, Magician. ROBERT TOWNSEND, BILL DUKE AND ANGELA RYE GUEST STAR – Jefferson Pierce (Cress Williams) and his family may have survived Tobias’s (Marvin Jones III) attack, but they’re not out of the woods yet. Concerned for the safety of Garfield’s students, the board considers a motion to shut down the school, forcing Jefferson to go to Napier Frank (guest star Robert Townsend) to sway the vote. Jennifer (China Anne McClain) struggles with her powers and her actions have unforeseen repercussions. Meanwhile, Anissa (Nafessa Williams) finds a new way to give back to Freeland. Lastly, Lynn (Christine Adams) continues her quest much to the dismay of Agent Odell (guest star Bill Duke). Bloody Disgusting has a poster for “The Body”, next month’s premiere episode of Hulu’s monthly horror series. Bloody-Disgusting also has the latest poster for Netflix’s The Haunting of Hill House miniseries. The official Power Rangers Instagram has revealed the cast of Beast Morphers—head on over to Instagram to see the rest of the supporting cast. The cast and crew of Nightflyers discuss George R.R. Martin in a new video. The archangel Michael struts around in Dean’s body in a new trailer for season fourteen. Syfy has also released a 30-second trailer for Van Helsing’s third season. Finally, Amazon has released a trailer for the second season of the podcast-turned-horror anthology, Lore.